Advertised as an evening of non-stop performances, SMTD’s 42nd annual Collage Concert certainly lived up to expectations. Featuring Symphony Band, University Symphony Orchestra, Chamber Choir, Orpheus Singers, Digital Music Ensemble, Jazz Ensemble, and numerous other groups of students from within the School of Music, Theatre & Dance, I was thoroughly impressed by the professionalism of the production. For one thing, if you’ve ever been to a collage-style concert before, you may be picturing a performance where half the time is spent waiting for set changes or performers to get to their places. This could not have been farther from the truth. The evening was truly exhilarating in the fact that there were quite literally no open spaces, or even a space to breathe, within the program. It was a wild ride of performance after performance, rapid-fire, with no breaks save intermission. The concert opened with a work called “Sound Piece” performed by the Digital Music Ensemble, and before the last note had finished ringing in Hill Auditorium, or before I could even realize what was happening, Symphony Band had already dropped the down beat of “War” from War and Peace by Michael Daugherty. The logistics and planning that go into the production of Collage must be mind-blowing, and yet it was pulled off without a hitch. The lighting changed, performers switched places on stage, and instruments were moved, all without the audience taking note. 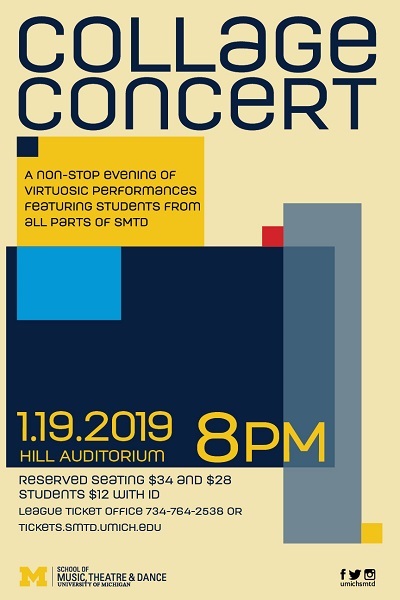 I particularly enjoyed that the concert showcased the full range of SMTD’s performing arts spectrum – music, dance, musical theater, and theatre. The Collage Concert was an opportunity to experience the offerings of groups that I might not otherwise hear or see perform. One of the most impressive, and entertaining, performances was Melissa Coppola and Annie Jeng’s rendition of Franz Liszt’s “Hungarian Rhapsody No. 2.” The penultimate performance, it was the one act for which the audience broke out in applause, despite the request in the program to “please hold applause until the end of each half!” Not only was it a virtuosic performance, the entire piece was a theatrical production in which Ms. Coppola and Ms. Jeng comically gesticulated and shoved at each other. At one point one shoved the other off the piano bench and onto the floor. Near the end of the piece, there is a section of repeated ascending scales in which one performer played a scale, went running from the end of the piano bench, around the piano, and to the other side of the bench, all while her counterpart played the next scale, only to arrive to the bench again to smoothly play the next scale while the other performer ran around the piano, and so the cycle continued. At the conclusion of the piece, the two high-fived at the playing of the final chord. Perhaps most impressive was that amid all the show and staged chaos, the piece was being played smoothly and expertly, such that it would have been stunning even without the theatrics! Another of my favorite pieces performed was “Nimrod” from Elgar’s Enigma Variations. An orchestral classic, it is melancholy, thickly orchestrated, and a pleasure to listen to. I expected a great concert, but the Collage Concert far surpassed my expectations. It was a fantastic evening that I thoroughly enjoyed, and the two hours that it ran for passed in the blink of an eye!